Keep your Scotty Cameron putter dry during and after rounds of play. The Scotty Cameron line of Titleist putters are widely considered some of the best products in the golf industry and typically cost around $300 each. If you've invested this sort of money in a putter, it's wise to take proper care of it to ensure it lasts you for many years. Caring for your putter is not time consuming; attention during each round of play and after keeps the putter in prime condition. 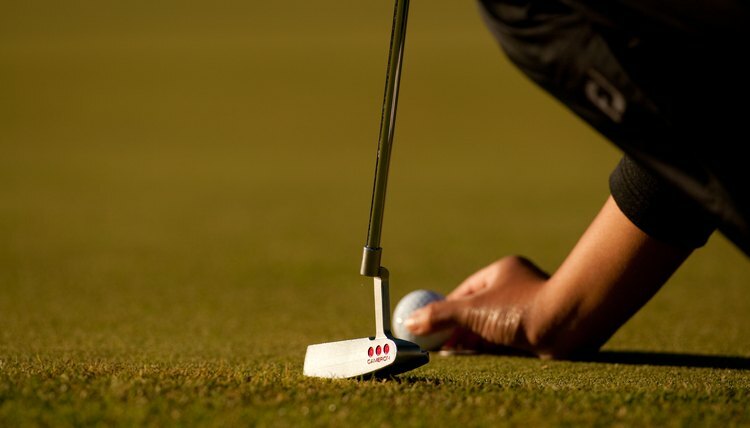 Wipe your Scotty Cameron putter thoroughly each time you use it during a round of play. As it comes into contact with the green, it can pick up moisture-laden grass or drops of dew. Wiping the club before putting it back in your bag is your first line of defense. Clean the putter with a lint-free, microfiber cloth after finishing your round. By this time, your golf towel might be wet and full of grass. Use a separate cloth to wipe down the putter's entire surface, paying special attention to grooves in the clubface. Mallet putters have more voids and areas that require cleaning than blade putters. Rub a Scotty Cameron oil cloth over the shaft and head of the putter, but avoid oiling the grip. After wiping the club, wrap the oil cloth around the head of the putter and cover it with a proper-fitting head cover. Store the putter in a dry environment in which the temperature is moderate. Basements and garages are not typically ideal. If possible, keep the club indoors. Can Ping Reshaft My Putter?